Well I’ve been reading up a bit on smaller tube amps, and whilst they make great sense, they all seem to be missing something, or prove to be too costly for my meagre budget. 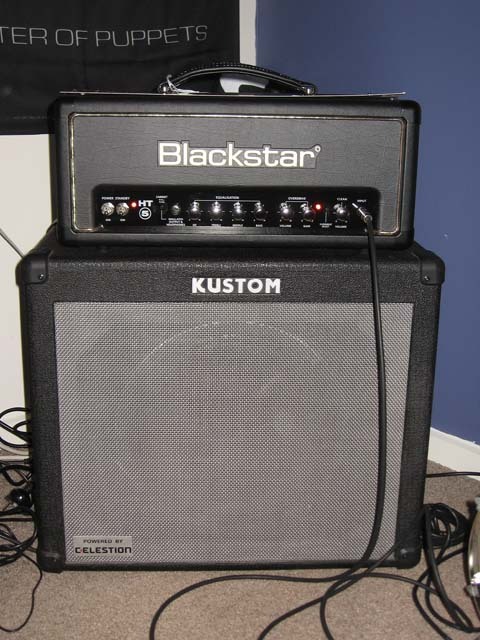 That was until I stumbled upon the Blackstar HT-5 head. I read through the specs and thought to myself ” 5W tube amp, two channel, FX loop – could be just right”. Then I saw the price, which seemed too good to be true. I chased down reviews, and Youtube videos to get a bit of a taste of what this amp had to offer, and it looked and sounded like it wasn’t going to disappoint. Great sounding for a bedroom amp, and seemed quite capable of keeping up in a jam/rehersal environment. I headed down to Better Music, my local music store. Low and behold they had the Blackstar HT-5 full stack in stock, so I went straight in to the amp room to test out. Now I was a bit dubious as to whether or not the 10inch speakers would really let the amp shine, but they weren’t too bad at all. I liked the sound enough to want to demo it at home with my own gear, and thankfully Better Music are happy to let you take gear home to test out before you buy. So I brought the HT-5 head home today, and hooked it up to the Celestion Super65 12inch speaker in my Kustom KGA65 combo amp, and warmed up the tubes for a minute or so. I dialed up a fairly balanced EQ setup, cranked up the gain and ripped out some chords on my EMG equipped Ibanez RG style custom. Wow – What a great sound! The HT-5 has a shared EQ setting for both channels which may seem like a drawback, but it is easy to dial in a setting that sounds great for both channels. The control that really makes this amp shine is the ISF (Infinite Shape Feature) dial. This control allows you to dial up a nice British style wooley sound, a mid-scooped US sound, and everything in between. One might think that this wouldn’t really have any effect on the tone, but it certainly does. I prefer a nice British Marshall-esque tone, and this certainly does a quite convincing tone. It also gets that modern US scooped sound for those who are more in to that tone. The wonderful thing about the ISF dial is that it comes in handy when playing the amp at low volume. The tone of the amp with the ISF fully on the British sound at low volumes can get a bit too wooley and muddy, but turn the ISF dial a little towards the US end and it tightens up real nicely. Turn the volume right up again, and just turn the ISF further towards the British end again, and you’ve still got that great tone at higher volumes. The amp also has a speaker emulator for recording or hooking up through a PA, and it sounds quite good as well. Great for recording quietly at night, or using through a PA at gigs if the amp and speaker cabinet you are using doesn’t quite cut it for the venue you are playing in. The Blackstar HT-5 is capable of great vintage clean and overdriven sounds, and if the gain is cranked right up it can do a great Metal tone. I tried a compressor pedal to push the amp in to more extreme metal tone and it covered it with ease. The tone is great at low and high volumes, and all in all it is an extremely versitile amp. 2 Responses to "Now this is what I call a Tiny Terror! 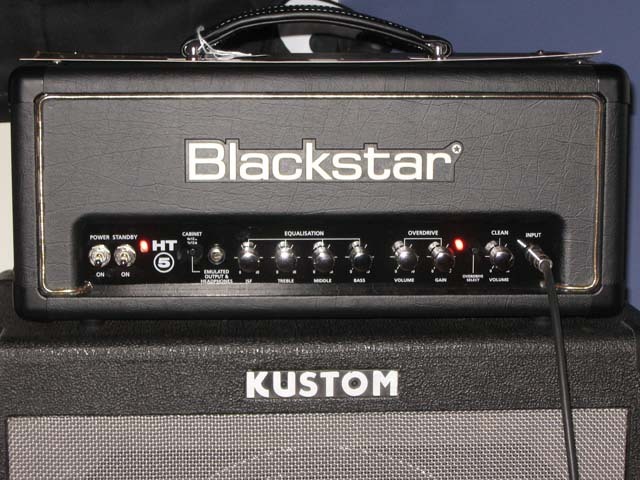 BlackStar HT-5 head review"
Great amp! The clean for me is an excellent tone, likewise the gain channel, its hard to find good gain and good clean in the same amp… I’m using the HT5R Head with 2 Celestion 10″ GOLDS.